Beautiful, attractive design with ocean colors for boys or girls. Different colors available. Price can seem constrictive when we all know kids grow so fast! Where's the mommy/daughter dual boards? Want to give your water kid the ultimate present, so they think YOU’RE a genius and want to hang out with YOU on the water? Creating sun-drenched memories with the family is what summer is all about. Having fun, staying active, spending time learning new skills together… that’s how we stay connected, and happy. WaterKids is the first brand to design a high-performance paddleboard specifically for kids that is not an inflatable. The WaterKids 8’0 All-Rounder is a sharp looking foam core board that has detail, style and integrity. For $699, your child gets a premium paddleboard designed and shaped for children that includes a leash for smaller ankles and a tri-fin set up for flat water paddling OR to ride on smaller waves. You also have the option to buy a carbon fiber adjustable paddle (also kids’ sized) that’s also excellent. WaterKids aims itself at being a ‘pro-style’ company that manufactures boards to the highest standard possible and to make their kids’ boards 100% as good or better than any adult style board. Each board goes through a rigorous R&D process with multiple prototypes exploring width, thickness and volume ratios. Each board shape goes through over 100 paddle sessions with kids on them before they are released to the general public. Waterkids prides themselves in creating high-performance boards designed with love, effort and a lifetime of experience. 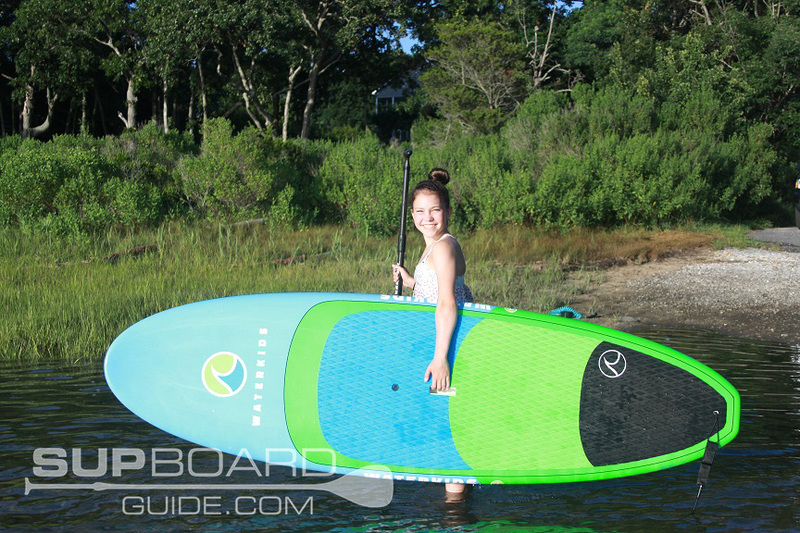 Unlike most kids’ stand up paddleboards, the Waterkids lineup of SUP include a full range of fiberglass boards, claiming there is very little detail that goes into designing inflatables. They spent a lot of time designing all the Waterkids boards and testing things like width/thickness/length/volume to make sure they came out with the best available product on the planet for kids in this weight range. Impressive. 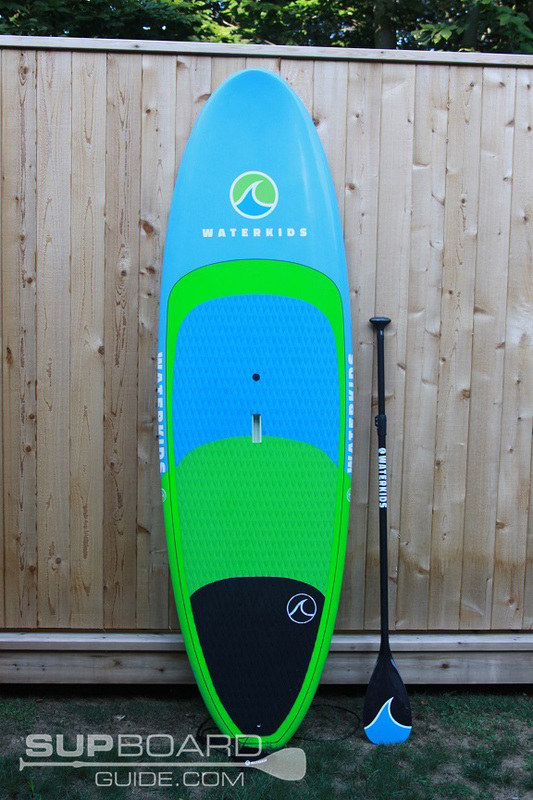 When I pulled the board out of the box, I was delighted by the look and feel of the Waterkids 8’0 All Around “Legend” stand up paddleboard. It has the shape and design of a high-performance board with tapered rails, rocker in the nose and a rounded squash tail that looks to be fun in the surf. I was impressed with its overall style, including performance diamond cut deck pads and color combinations. Really, this would be a fun board to test! I captured my friend’s 12-year-old niece for the wet work. We met down at the bay one evening and, Dakota, who is a proficient paddler, took it or a spin. Immediately, she talked of the board’s lightness (16 Lbs) and maneuverability. Dakota spun that thing into the wind and hauled back, leaning into it. At about 80 pounds, Dakota is lithe and athletic. The board’s buoyancy and volume fit her perfectly, and she was able to glide across the water towards me in perfect balance with her surroundings. Dakota compared the 8’0 All Around “Legend” to the adult boards she’s ridden, saying it had the same shape and feel, but was so much easier to manage as it was designed for a lighter person in mind. She especially appreciated the diamond cut deck paddling which covers approximately 75% of the board. She liked that it gave her feet a good grip but also had some texture to keep her feet ‘awake’ while paddling. When I jumped on that board, at 135 pounds, it took a minute to find the center point of balance, and I felt immediately that this board’s volume and weight distribution was for someone much lighter. However, once I got the hang of it, the board floated me nicely. It turns on a tight radius, has excellent buoyancy and, again, feels like a professional board design underneath my feet. In fact, I’m so excited about its shape and design, I hope to get it out in the surf in Montauk at the first available date! The entire board is made of Waterkids hardtop EPS construction, the same as any adult board which makes it very durable and fast. It comes with a center handle and at 8’0 feet and only 16 pounds, it is easy for anyone to manage or carry. 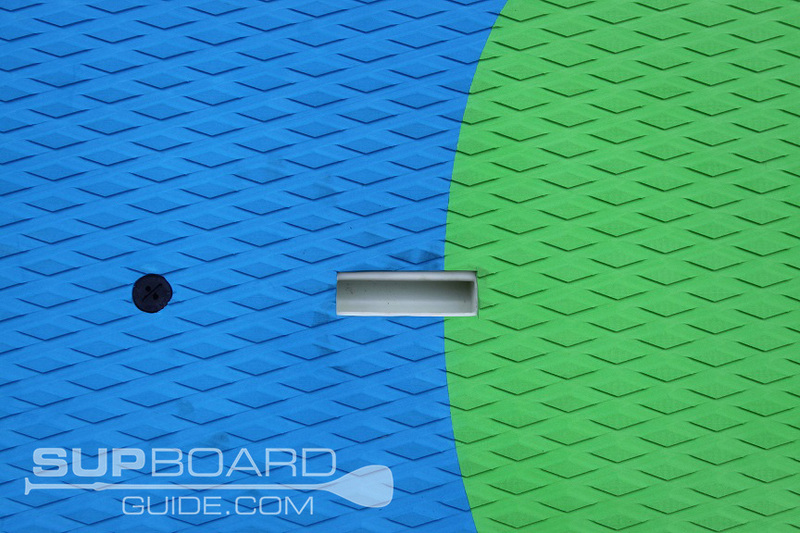 The diamond cut soft traction pad gives extra grip underfoot and easy to move one’s feet around on the board. This Waterkids performance paddleboard is 8 feet long by 28 inches wide. It comes in at 4 inches of thickness and holds 110 liters in volume. It features diamond cut traction, a tri-fin set up (fins included) plus a vent plug to keep the laminate from bubbling if kept outside. As with all EPS constructed boards, this one would do better if kept in a bag and out of the sun as much as possible. It’s so gorgeous to look at, you wouldn’t want to mess up that paint! 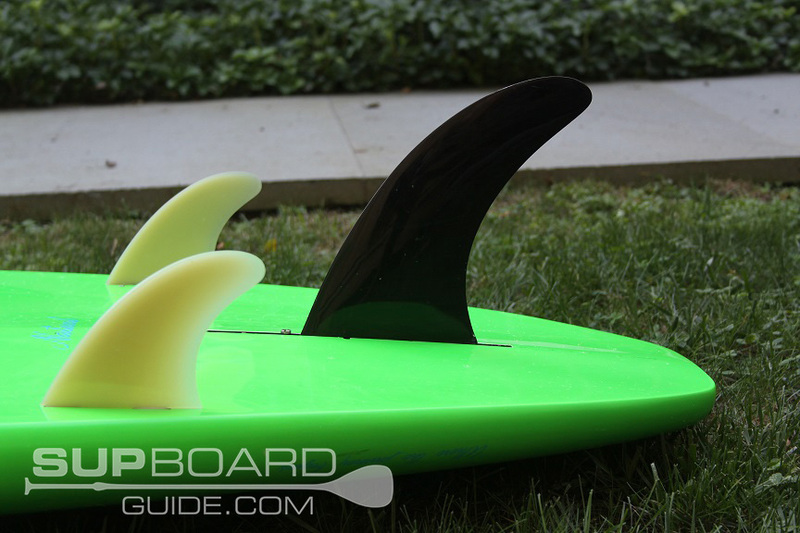 The Waterkids 8’0 comes with a Tri-Fin set up that includes a center fin and two side bites. These are standard insertion fins that require a fin key to tighten and remove. The center fin includes a fin plate so bring your screwdriver to affix properly. Fin key is included. At 8’0 x 28 inches and 110 liters, the Waterkids “Legend” is one of the best kids SUP boards I’ve seen on the market. A rounded nose with a slight rocker makes this board easily transferable from flat water paddling on lakes to easy turns in the surf. At 28 inches wide and 4 inches thick, the 8’0 is both stable and performance shaped. Smooth rails at the front that taper to a harder edge closer to the tail, create a great & forgiving surf shape for any rider. That rounded squash tail also gives this board additional maneuverability in the surf for turning and cutbacks. An experienced rider will make this thing rip in the waves! 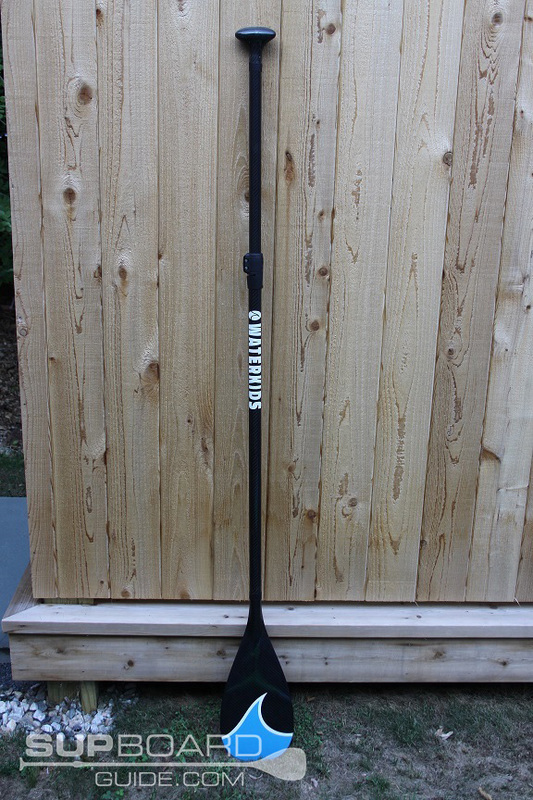 The 8’0 came with a beautiful carbon fiber adjustable kids paddle (more on that below), a quality leash made for smaller ankles and center fin plus two side bites. Purchase includes the deck traction, fin tool and a plug for ventilation. I think one of my favorite aspects of this board was the addition of the paddle. All carbon adjustable and super lightweight, the paddle fits a range of paddlers from 3’6 ft to 5’6 ft in height. Beautifully crafted with a wave design, the paddle shaft thickness is perfectly designed to fit the hand of a smaller paddler. Easy pin and lock system for quick changes in length make this a paddle the family can share. Its reduced surface area blade in a classic teardrop shape is well-designed to make paddle strokes more efficient, effective and powerful for a smaller paddler. In my book, the paddle is the engine, the board is the vehicle. Waterkids’ well thought-out design of this paddle shape will not only bring positive results for kids but will also allow them to paddle properly using the muscles they have to move this lightweight board through the water. Note: The paddle is priced at $150 as of August 2018. A well-designed leash comes with the Waterkids 8’0 All Around SUP. At 8 ft long, it fits the board nicely. Its thickness ensures a paddler’s safety and, what I liked, was that the ankle velcro was made specifically for a smaller ankle. No more overlapping the leash around an ankle and hoping it won’t come undone! This leash, as with everything in the Waterkids’ kit, is created for the paddler its meant to support. Bravo, Waterkids! Overall, I’m giving Waterkids a 9 out of 10 for design and functionality. This is – by far – the most performance-oriented youth board (that’s not custom made) on the market. 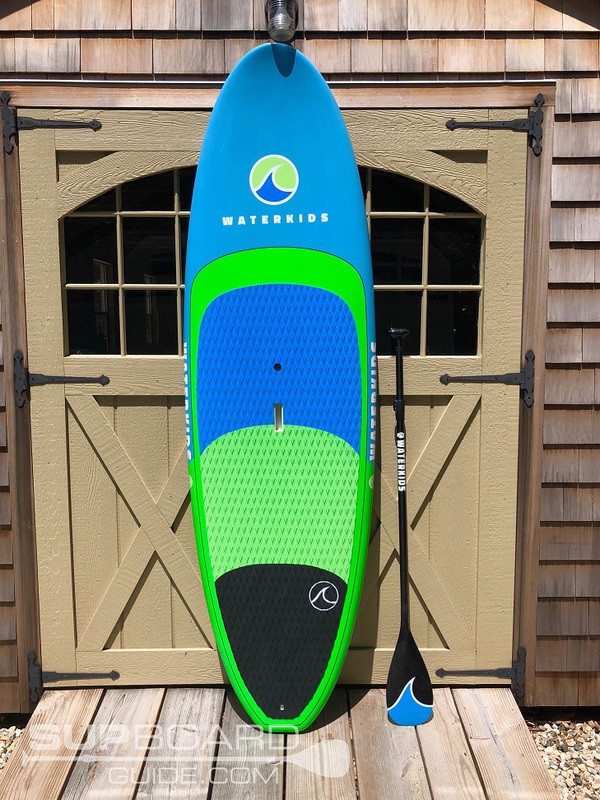 For multiple levels of paddlers, the Waterkids 8’0 can support a beginning paddler by offering a well-shaped board, designed for a lightweight paddler to help get them started. 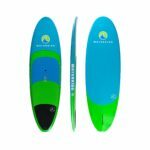 If your water baby is looking to step it up a notch, this same board carries a performance aspect to it that will allow his/her skills to progress through its maneuverability and style. Also, an excellent board for a paddler to progress in making turns, finding speed and creating style in the surf. NOT just a point-and-go board, the All Around 8’0 is for progressive riders looking to take their craft to the next level. At $699, it is pricey for a kid’s board, but then quality is everything when it comes to paddleboards. Worth every penny in style and construction if your child is serious about being on the water. It is a board he/she can grow into and enjoy for years to come. Note: The board is available in 3 different colors.